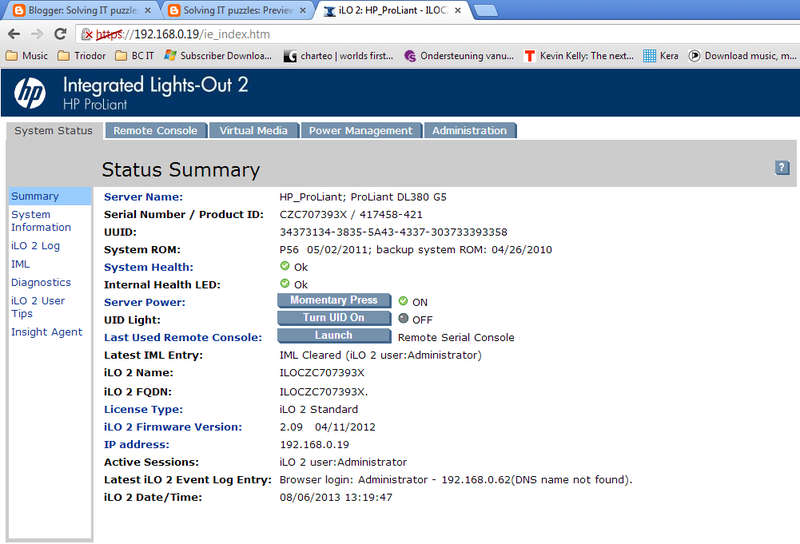 One of the nice features of my server is the iLO 2 interface which stands for Integrated Lights Out. 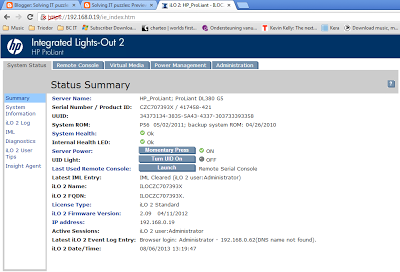 It provides a web interface that allows me to see the server health and remotely boot it or shut it down. As soon as the server is connected to the power net, the iLO interface will go and get it's own IP ( static or dynamic, depending on setup at startup ). On this IP you can connect to the iLO interface and boot the server up, shut it down, check on the health and temparatures etc. The former owner of my server told me that it cost him approx 50 euro's in electricity to run this server non-stop. Since this is my lab toy, I will not be running it all the time and thus this iLO is ideal to remotely start and stop it whenever I want. Only thing for me to do is assign a static IP to iLO and port forward it on port 443 - since it's over HTTPS.